Hardback magnetic menu boards and menu frames come in a variety of beautiful colors and materials to fit the style of any restaurant or bar. 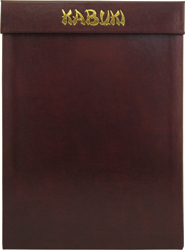 Magnetic Menu Boards are a stylish alternative to traditional menu covers. The magnetic horizontal hinge across the top can safely hold up to two menu inserts offering easy access for pricing changes and other menu updates. 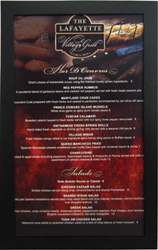 Menu Frames feature a 3/4" wide frame and can display paper menus on one or two sides, making them an excellent choice for simple menus and special promotions. Optional 2" header allows for custom foil stamp of your logo.